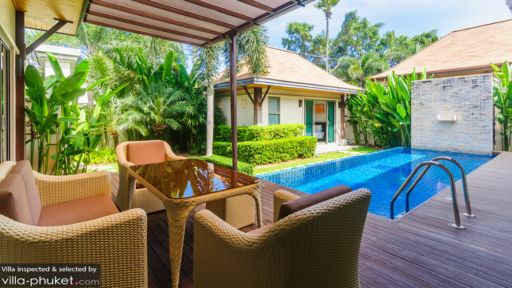 Villa Ariwiki is a three bedroom tropical garden haven located in Phuket, Thailand. Here you can unwind in the outdoor sala by the pool or in the open-plan living space while enjoying the company of your loved ones. Here, it’s easy to get a taste of Thailand’s famed beaches as Nai Harn Beach is only a three minute drive away. Villa Ariwiki is perfect for those who want to experience Thailand’s beach scene while having all the comforts of a private modern space. Here at Villa Ariwiki, guests can sleep in complete comfort in its master bedroom. This room has a plush king size bed that will help you get much needed rest. The room is bright and airy, aided by tasteful oriental decor. In the evenings, you can curl up in bed with your loved one and watch on the LCD TV. The master bedroom also comes with a bright en suite bathroom equipped with a tiled bathtub. Aside from the master bedroom, Villa Ariwiki also has two guest bedrooms for the enjoyment of your family and friends. Each bedroom has a comfortable king size bed to ensure that they get their much needed rest. Each bedroom also has an en suite bathroom where they can wash the day away in privacy. Lush green palm trees, plants, and shrubs fill Villa Ariwiki’s garden area, complementing the striking blue of the eight meter swimming pool. The soothing blue tiles of the pool will surely entice you to take a dip every time you see it. The covered wooden pool deck wraps itself around one side of the pool. On the deck are two wooden chairs and a small dining area where guests can sit back and enjoy the pool and garden. In the evenings, you can come and have dinner here. If you walk through the sliding doors right next to the outdoor dining area, you will find yourself in Villa Ariwiki’s open-plan living area. Here, the kitchen, dining, and lounge are located in a single space that combines east asian inspired designs, wooden furnishings, and modern amenities. In the lounge area, guests can kick back on the L-shaped plush white sofa. There is an LCD TV, encased in an intricately designed wooden cabinet, from which you can enjoy a number of TV channels. Behind the lounge area is the dining and kitchen. Both feature dark wooden furnishings. The kitchen is fully equipped and has the necessary amenities for you to create delicious meals with your family. The staff at Villa Ariwiki are dedicated to making your stay at the villa enjoyable and memorable. Upon arrival, guests will receive a welcome pack and complimentary toiletries. At Villa Ariwiki, the housekeeping service will make sure that the villa stays clean and comfortable for your entire stay. Here, planning your itinerary and checking the nearest restaurants online is also made easy because there is WIFI access throughout the villa. 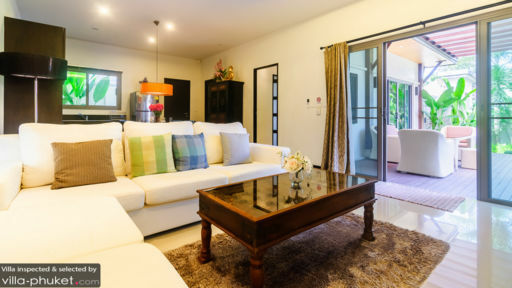 Villa Ariwiki is located in Phuket, Thailand just a three minute drive away from the popular Nai Harn Beach. Here you can lay down a towel and relax by the sea or grab a drink in one of the hotels by the beach. If you want to explore other beaches, Rawai Beach is 2.6 kilometers away while Kata Noi Beach is 6.5 km away. If you do not want to travel away from the villa, there are a few restaurants offering various cuisines within three minutes walking distance. 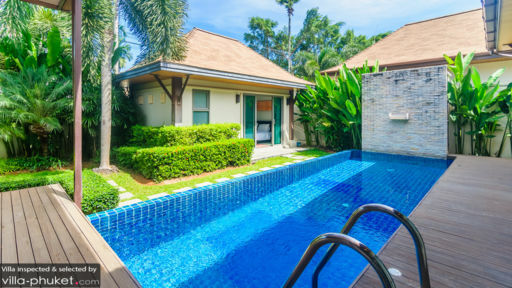 On the other hand, the supermarkets are 5 kilometers away from the villa while a gym, massage place, and convenience store are at least 600 meters away.